Birds eye views are some of the most extraordinary experiences one can indulge in. 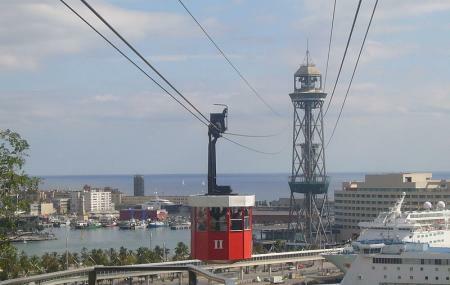 The Teleférico Del Puerto is one such aerial tramway in the city of Barcelona, Spain that guarantees you a great memory for a lifetime. Opened in the year 1931, the tramway offers mesmerising views of the beautiful suburb of the while covering stations such as Torre Sant Sebastià, Torre Jaume I and Estación de Miramar in Montjuïc. The tramway runs at a speed of 3 metre per second and is an ideal getaway to enjoy with your entire family or friends. The entire ropeway is 1.3 km long and is open all days of the week while offering some majestic views. How popular is Teleferico Del Puerto? People normally also visit La Boqueria while planning their trip to Teleferico Del Puerto. Don’t do it. Takes way too much time queuing. Once you are onboard, you will be trapped in a little cart with too many people in it. You won’t see anything unless you are right by the windows. It’s a very short ride. But then maybe that’s a blessing. You will be glad to get out. Should have trusted the guidebooks and avoid this gondola. One way ticket down to Barcelonetta cost 11€ and you have to stand in the queue more than 25 minutes. Short ride, nothing special. Better go down by bus or by walk. We wanted to buy tickets. The man in the booth just had customers before us and saw us in que. He didn't look at us when we approached, he didn't even greet us. He was looking down in his phone. His phone was fully visable in front of us on the table. He had BET365 app visable and was poking around in it. That is a casino app. He poked around on that app for a few moments and didn't say anything to us, two costumers a few inches away from him. I even said hi. He didn't reply. There was no glass screen between us. So I know he heard us. In the end, I needed to rais my voice to get his attention. He then reluctantly answered a few questions, very short and with a rude tone. As if I had bothered him in his booth. In just a few moments, he became the single worst employee I've encountered in MANY years. PLEASE fire him! We ended up NOT buying 2 return tickets for the cable car just because of his awful attitude as a representative of the cable cars. He worked there at 2019-03-09 at 16:15.